Arr, me hearty blog readers. I wanted to share with ye about how I be havin’ fun with a grand and magical language! Enter this magical land through this here website Talk Like a Pirate Day and ye ne’er be bored. And in case ye haven’t figured it out, it be pirate talk. Arrr, I once heard of a reporter who interviewed a pirate. He was fascinated by a pirate who had an eye patch, a hook, & a wooden leg. "Tell me, how did you get your wooden leg?" "Well, ya see, we hadda turble, turble storm, & inna rockin' of the sea & the deck, it snapped me leg clean in half. So I got me this peg leg." " Wow, that's terrible. What about your arm?" "Aye, that was another turble day. A storm was blowin', with man-eatin' sharks all around. A big wave, & one came clean up onto me poop deck & bit me hand off. Arrr, that was a sad day, I tell ya." The reporter sat entranced, mouth open in wonder. "My goodness, you've certainly had your share of injuries. How did you you lose your eye?" "Aye, that. That was caused by seagull poop." The reporter was stunned. "Seagull poop? I had no idea seagull poop could cause blindness." And the pirate replied, "Well, it was me first day wit the hook, ya see..."
Oh my cow! Too Funny. 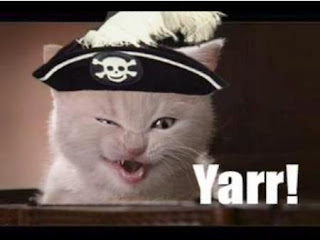 With your permission, next year I will share this on Talk Like a Pirate Day. It will be a good addition to the site and the holiday! Of course! I don't know where I first heard it, so I can't give credit to whomever started it. It's one of my favs!